Cinco de Mayo is NOT Mexican Independence Day - that's September 16. 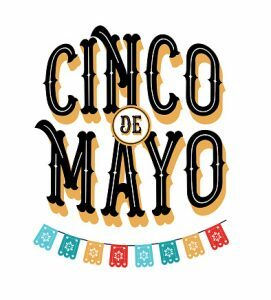 Cinco de Mayo, the 5th of May, celebrates an incredible victory by native Mexican soldiers over the imperialist French who tried to rule them way back in 1862. The French wanted to collect their debts from Mexico and, rather than making a deal with Mexican government, decided to put into power a new French emperor, Maximilian. Most native Mexicans were furious. The Mexican leader, General Zaragosa, ordered Colonel Diaz to attack the flanks of the French army with his excellent cavalry. The French chased them, and were defeated. Those French forces that remained were ordered to attack. They charged through mud, a thunderstorm, and a stampede of cattle stirred up by Native Americans armed only with machetes. They, too, were defeated. This victory for Zaragosa and his men, at two to one odds, was not only important to the Mexicans, but also to the United States. The French were planning to supply the Confederate Army. With the French influence gone from Mexico, the South lost its chance to rebuild. Union forces continued to grow stronger, and ultimately the South was defeated in 1865. The Union reinforced the Mexican Army immediately after Zaragosa's victory, and the American Legion of Honor marched in the Victory Parade in Mexico City. Cinco de Mayo is a time to celebrate the friendship between Mexico and the United States. Across the United States, Cinco de Mayo parties give everyone a chance to learn more about Hispanic culture.